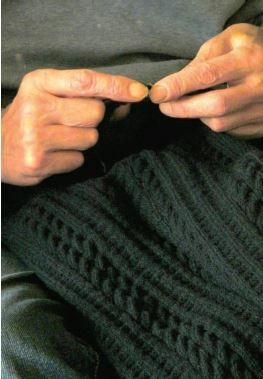 Alf Hildred knitting a traditional gansey. Photo by Deb Gillanders. These hands are Alf’s hands. Alf Hildred, a retired trawlerman in Whitby, England, has been knitting traditional gansey patterns for the past forty years. You go, Alf! I have long been a gansey sweater fan. They seem to exude both magic and mystery and evoke romantic visions of life at sea. Traditionally, however, ganseys were the workhorse garment worn by fishermen and sailors. And there was virtually no romance in the maritime lives of these hard-working seafarers. Deb Gillander’s sweet gansey bag project. Photo by Joe Coca. If you, too, are a gansey fan, you’re really going to like our newest PieceWork eBook–Glorious Ganseys to Knit! 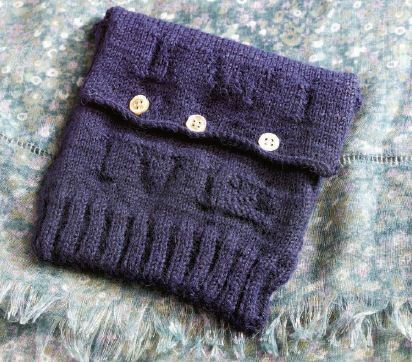 In addition to four gansey projects–a small bag designed for novice gansey knitters and a traditional gansey sweater with matching hat and socks for a favorite child–Deb Gillanders’ delightful article, “The Migrations and Evolution of the Gansey,” sets the stage. The geographical spread and evolution of the garment is associated with the annual migratory route taken by southbound herring off the east coast of Scotland and England, which the gansey wearing fishermen followed closely. Fishermen of the north and east coast of Britain also sailed to Norway in search of herring. 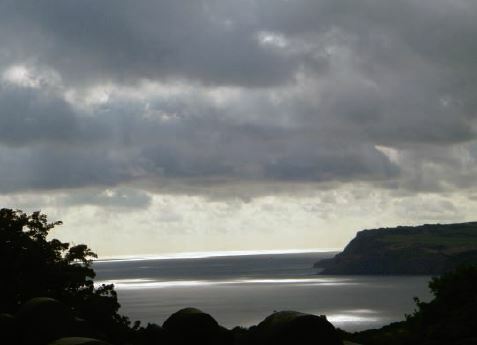 Robin Hood’s Bay near Whitby, Yorkshire, England. Photo by Deb Gillanders. The wool fabric also had a smooth surface that provided a blank canvas for creative knitters to develop patterns of intricate combinations of stitches that also served to increase the garment’s insulating properties. It’s been said that “you could tell a man’s port of origin by the pattern on his gansey” and that this knowledge was useful in identifying an unknown man who died at sea. Not necessarily. And Deb will tell you more about Alf and his gansey knitting! Get your gansey on! Enjoy Glorious Ganseys to Knit.